Some people are great when working individually, while few others simply get fantastic results when in a team. Similarly few recipes are amazing all on their own, while the beauty of few others comes out when complimented by a fellow recipe. In this category falls these famous Indian Makki Ki Roti. Yes, you got it right. Nothing beats out the combo of Makki Ki Roti and Sarson Ka Sag. 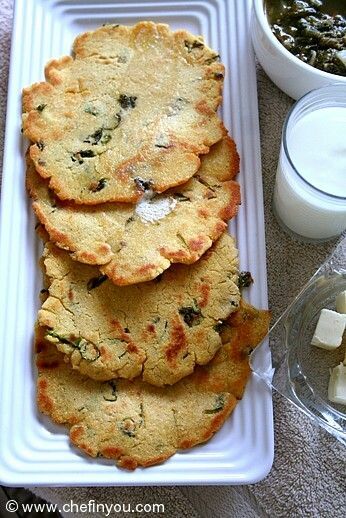 Makki in Punjabi stands for Maize and roti is Indian flatbread. These are prevalent during the North Indian winters. 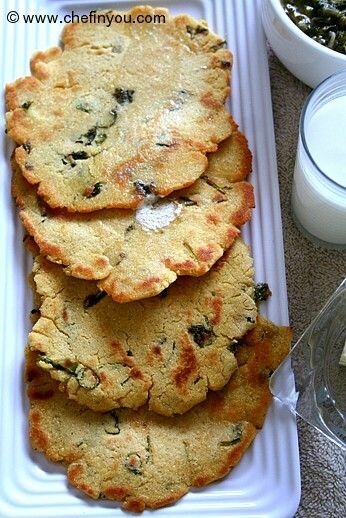 If you are an expert in making Corn Tortillas, then you have it easy while making this too. This is a unleavened bread and the lack of gluten makes it hard to roll out and make it like a traditional roti. The traditional way of making it would be make balls of the dough, flatten and shaped using the palms of both the hands, where there is a to and fro transfer of the dough between the palms. 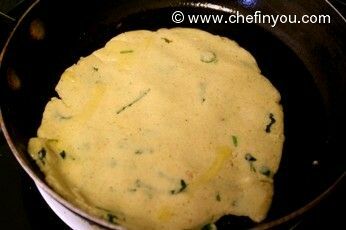 Thus flattened, it is dropped on a hot Tawa (griddle). It is near impossible to roll this out using a rolling pin. Check out this video to see it in action. 1. 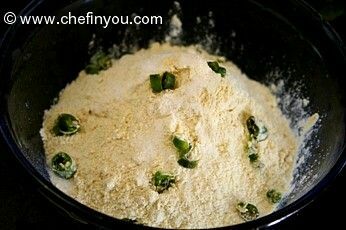 Mix the all the dry ingredients together. 2. Make a hole in the middle and pour hot boiling water to it. Mix it lightly with a spatula (you dont want to burn your hand). Let it sit for few minutes or until you can handle the dough. Why hot water? Well, a friend once informed me that this helps the flour to settle well and also makes it easier to flatten it without getting the edges all frazzled looking. I am not sure but I think I used about 1/2 -3/4 cup of water. Make sure you add carefully. 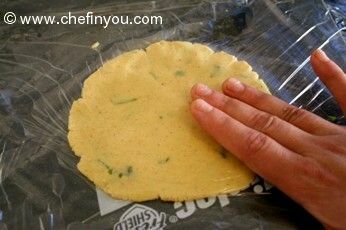 You want a thick smooth dough which is not too tight or soggy. 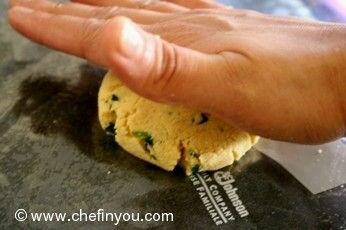 You should be able to shape the dough into a ball without it sticking all over your palm. 3. Knead it well until smooth. 4. 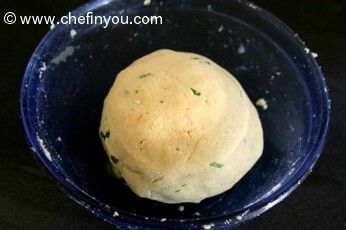 Divide the dough into small balls. 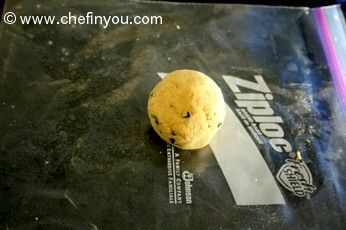 Place it on a lightly greased zip lock bag or any plastic sheet you have on hand. 6. 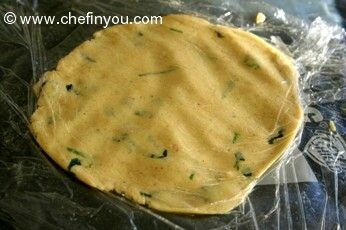 Now place another plastic sheet on top of the flattened dough and slowly pat it down to flatten it further. 7. I usually flatten it to a size which fits my palm. I do that to make it easier on me to transfer this to a tawa. 8. Remove the top plastic sheet. Now very slowly transfer the pancake on to your palm. Be careful since the dough can break easily at this point. Thats why the one fitting in your hands will make this process easier. The plastic sheet will peel away easily since you have greased it. 9. Now drop this on to a hot (med-high heat) pan. Drizzle some ghee all around it. 10. Turn it on the other side after about 3-4 minutes of cooking or when you see it turn a deeper shade of yellow and brown red spots. Serve hot topped with some butter. And oh yes, don't forget the saag! I made this yesterday. Didn't have Cilantro, inspite of that turned out very good. thank you. I made this today and recorded my video too. 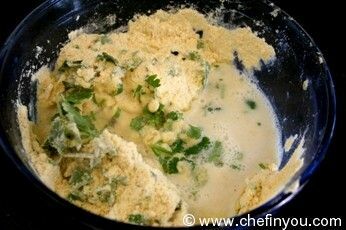 I used Methi leaves (Fenugreek seeds) instead of coriander leaves as told in this recipe. 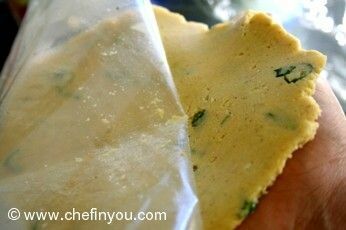 I love methi and wanted to have its flavor in the Chapatis. Can we use yellow corn flour?? Hi DK...this looks yummy.... is it yellow corn flour which we get here in indian stores in Usa?? Hello DK, I made this makki ki roti with Sarson ka Saag and my whole family loved it specially my hubby. Thanks for sharing and showing easy steps. I used to think cooking Makki roti and saag is very difficult but your step by step instruction made it so easy I can't wait to cook again. Thank you very much DK. 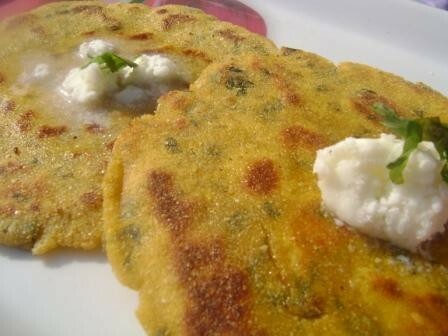 Makki di rotti with sarson ka sag is a standard meal in Punjab in winter, because that is when you get sarson ka sag. We don't get sarson ka sag anytime in south india. My daughter had that craving to eat it during her pregnancy. 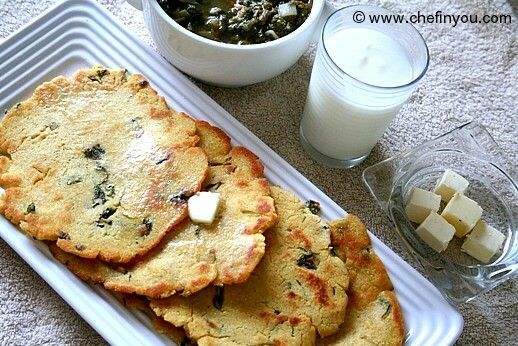 I hit upon the idea of making palak ka sag just the way sarson ka sag is made and gave it with makki ki rotti. She enjoyed it and wanted to know how i managed to get sarson ka sag? Wow..the makki ki roti looks delicious. I simply love the photographs you take. And the coriander addition to the roti sounds good. I am definitely going to try this. wow! my hubby luvs it...but i was luking 4 a right technique 2 make it...thnx dear....will try it now...i just luv all d recepies posted by u! saw the mail and thankyou for the lovely receipe .now no confusion (whether to use cold or hot water for mixing)wil try it and let u know the resuts.wishing u "HAPPY HOLI"
Wonderful. I got a tortilla press for Christmas and haven't had a chance to use it yet. A must try. Bookmarked! I am very excited about making these! 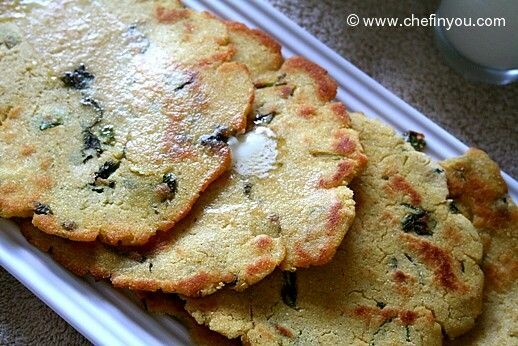 I grow mustard greens and now I have a new use for them in the saag you posted last week and now these amazing corn roti. Much of your lovely Indian food is being made and enjoyed in northern Ontario! I can't thank you enough for all of these fantastic recipes! I have loved Indian food, and the people, for many years and started making it 40 years ago. You are expanding my horizons and I am grateful for that. 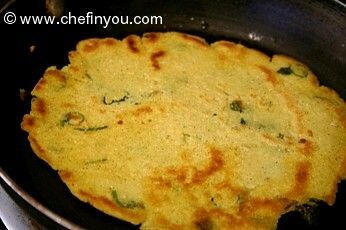 Hi Lovely step by step pics of makki di roti..looks so tasty and inviting!! First time here. Lovely blog. Makki roti looks delicious. Looks awesome!! Love Makki Di Roti. ROti looks excellent, never tried at home...will go around for the makki atta here..
Love rustic rotis like this one. Nice step by step presentation.Is Mexican Maza herina same as makki flour..?For me its very hard to get indian grocery here, so i can try with mexican flour.. There you go...Now I feel like kicking myself for not giving in the temptation to add onion, chillies etc.As I already told you about my failure while making delicious makkey di roti,,it was anything but tasty, with just salt and ghee.Next time maybe I will add onions, chillies, coriander and some fresh garlic stems and bulbs to it.It might not taste authentic but I m surely gonna love it that way ;-) My MIL use the Plastic sheet method, but me and my mom make such flatbreads of various flour by direct pressing the dough on hot griddle.The shape surely isn't perfect , but it surprisingly gives nice rustic flavor. WAW!nice...hey DK how do manage to post one recipe every day?I really appreciate your work.I always look fwd for ur post. They look lovely. I tried making corn tortillas, but they kept falling apart. Thanks for the good rolling tip! Liked your recipe.Nice twist of adding green chili and cilantro.I make it just plane with sarso ka sag.Check my website.Next time I am going to try with chili and cilantro.Thanks for sharing. hey great and simple step by step presentation..love the clicks too..why dont you send this to Pari'combo event..